Brussels, 27 January 2014 – The European Interactive Digital Advertising Alliance (EDAA) has today published its inaugural annual report for 2013, highlighting the pan-European self-regulatory initiative to provide consumers with greater transparency and control over digital ads based upon previous browsing activity – Online Behavioural Advertising (OBA). 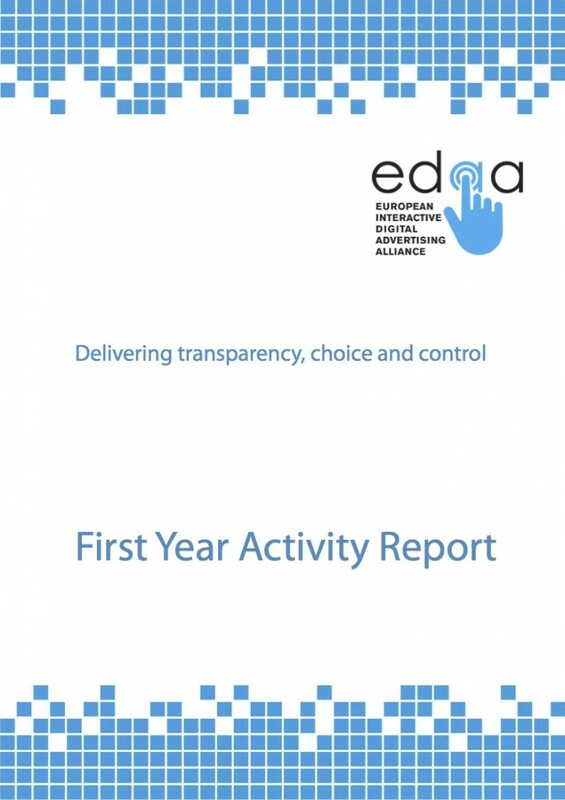 The EDAA report provides an overview of the Programme and its rollout to-date, as well as the EDAA’s priorities for 2014. It demonstrates the significant investment advertising businesses are making to give European consumers more control. With the support of the entire EU advertising sector, the EDAA’s report encourages businesses to get involved and comply. * Company awareness and uptake of the initiative is increasing: the EU programme now covers the vast majority of the market(s). * Visibility of the icon in or around ads and on web pages is growing at an exponential rate: over 120 billion icons delivered in 2013 through EDAA’s Approved Icon Providers (Evidon & TRUSTe). Transparency and control for all European consumers is only a click away. * The pan-European Consumer Choice Platform at www.youronlinechoices.eu is now live in 30 markets (and 26 different languages), including Croatia, the newest EU Member State. The site now has an optimised mobile version and consumers using the Firefox and Chrome web browsers can use a browser plug-in to better preserve their choices. * Many businesses are now demonstrating full compliance via the EDAA’s trust seal provided via independent Certification Providers (ABC, BPA Worldwide, ePrivacyconsult and TRUSTe). * The pan-European consumer awareness campaign has been rolled-out in the UK, Ireland and Germany to raise consumers’ awareness of the icon, and what it means. These markets have benefited from strong industry support (including donated inventory) and substantial consumer engagement. The campaign will continue to expand across other European markets in 2014. * National advertising Self-Regulatory Organisations have extended their remits to handle consumer complaints in seven EU markets to-date, with more to follow in 2014. Any consumer complaints will be handled in a consistent way, recognising the pan-European context of the initiative. In a nutshell, the self-regulatory programme is consistently delivering on industry commitments to empower consumers across Europe.